There are so many people who were wandering that if they should move from iPhone 5 to iphone 5S. So you need to know the differences and features of iPhone5 Vs. iPhone5S to help you make a buying decision. iPhone 5 and iPhone 5S look very much alike. Physically there are very less difference between the two phones. The first difference is in home button as it has been changed from rounded square to sapphire crystal button. iPhone 5S back has a new oblong-shaped dual flash, “iPhone” logo sports the new font to match iOS 7’s Helvetica Neue Ultra Light typeface. Color is the another major difference. iPhone 5 was in black or white, the iPhone 5S hasy champagne gold and muted space gray. iPhone 5 has A6 chip and iPhone 5S has A7 chip processor. The new chip increase performance and graphics twice on iPhone 5S. Means iPhone 5S launches apps faster, and plays graphic-intensive games. iPhone 5S also runs on new M7 motion co-processor that handles the load from the compass, gyroscope and accelerometer. iPhone 5S camera has same 8-megapixel iSight camera as iPhone 5, but also has a new five-element lens with larger f/2.2 aperture.Sensor has also improved, with a 15% in active sensor area. The iPhone 5S new dual-LED Two Tone Flash. One bulb is cool and white, while the other is warm and amber. 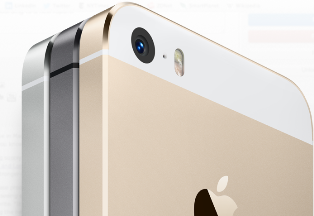 The iPhone 5S has a larger capacity battery rated at 1,540 mAh over the iPhone 5’s 1,440 mAh. iPhone 5S has new feature, the fingerprint sensor called Touch ID. This is related to the phone’s security and authentication feature. The sapphire crystal capacitive touch sensor record your fingerprint to unlock the phone. Should you upgrade to iPhone5S? With all these features, the question still remains: should you upgrade? Consider if all the internal upgrades are worth the extra cash to upgrade to a phone that looks almost exactly the same as your current one. However, if you are a loyal Apple fan, I would like to hear your opinion on current n and suggestion for iPhone 5 users. Do you believe that iPhone5 users change their iPhone for iPhons5S model?